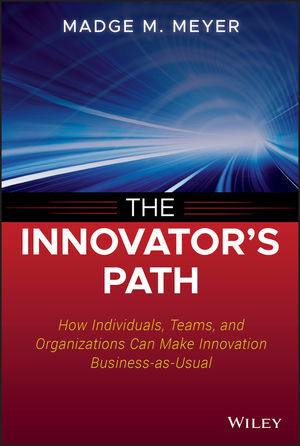 The Innovator’s Path introduces business readers to thought leader Madge M. Meyer’s unique, cross-cultural perspective on corporate innovation. The book presents eight essential disciplines (Listen, Lead, Position, Promote, Connect, Commit, Execute, and Evolve) that pave the way for individuals, teams, and organizations to continually innovate in ways that create new business value. The author overturns existing assumptions about inspiring and managing innovation, while offering new insights and practical advice for aspiring innovators and corporate leaders. Meyer demonstrates her points by telling the stories behind many of her award-winning results and adds engaging personal anecdotes to illustrate many of her points. The book also contains contributions from an extraordinary and diverse set of industry innovators. Whether your focus is on your career, your team's success, or your organization's future, The Innovator’s Path provides you with the insights, strategies, techniques, and inspiration you need to accelerate your innovation progress. MADGE M. MEYER is a public speaker, author, and founder of Madge Meyer Consulting, LLC. She has received twelve personal awards for her industry and community achievements. Formerly Executive Vice President and Chief Innovation Officer & Technology Fellow at State Street Corporation, she oversaw the company's global Information Technology infrastructure teams, which earned thirty-two innovation and excellence awards under her leadership. Meyer also held executive positions at Merrill Lynch and IBM and serves on several boards in industry, academia, and nonprofit institutions.